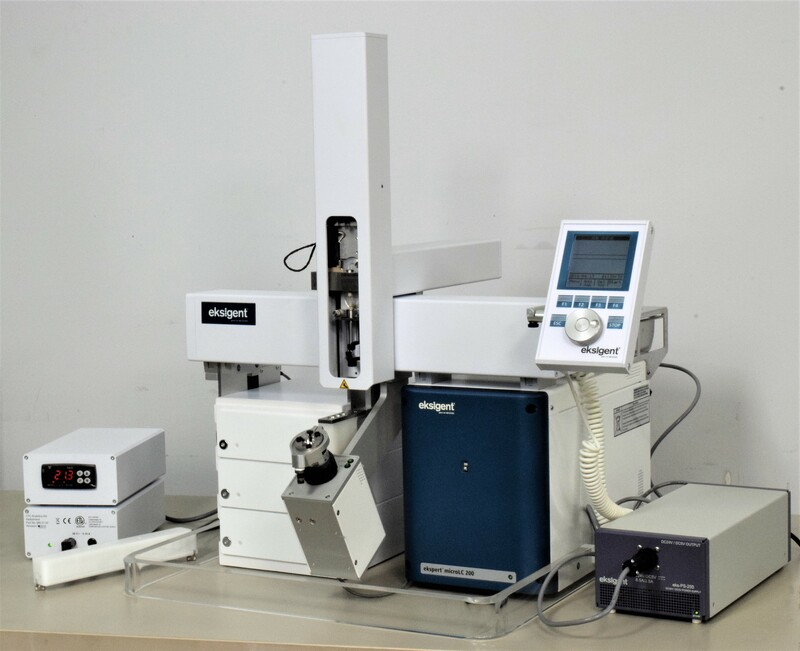 AB SCIEX Eksigent Ekspert MicroLC 200 CTC PAL HTC-xt Liquid Chromatography LC/MS . New Life Scientific, Inc.
Includes 90-Day Warranty. Sample Arm Tested. - Communicates with software. Autosampler tested and working. - Most of the peripherals have mfg. date of 2012. **Software can be downloaded for free from the manufacturers website. The AB Sciex Eksigent MicroLC 200 is in great cosmetic condition with little wear and cosmetic flaws. The system is quite young, being manufactured in 2012 under the AB Sciex label. Some testing has been performed to confirm the functionality of the autosampler, and the system does exhibit signs of being fully functional. Service from Eksigent will be required to ensure proper set-up and functionality of this instrument.Also, this system will need injector tubing and fittings as well as wash station bottles and tubing in order to be complete. This instrument is warranted to be fully functional and is protected by our 90-day warranty. Due to the sensitivity of the instrument, we recommend professional calibration and installation prior to application. Our in-house technicians did a visual inspection on the AB Sciex Eksigent MicroLC 200 and found it to be in great cosmetic condition. The system was powered on and successfully went into ready state. Using the free Eksigent 4.0 software, the instrument communicated properly. Using PAL software, the autosampler arm was operated and sampler routines could be run. Due to a lack of Eksigent drivers the technician was unable to teach the location of the injector, inject a sample and test the UV light and detector.